The GS05 and GS15 Series Grading Scrapers are ideal for landscaping, small farms and ranches, hunting camps, large estates, and small acreages. The GS15 is also ideal on sod farms. The GS25 Series are ideal for renovating gravel driveways and roads, levelling construction and turf sites, and cleaning barns and chicken coups. 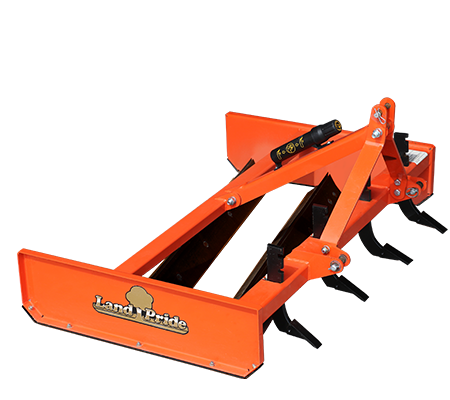 Unlike a box scraper, they are not designed to transfer large volumes of dirt from one location to another and as a result do not require the additional horsepower that a box scraper requires. Nor does it require the tending of tractor 3-point lift controls to maintain grade that a box scraper might also require. Simply setting a properly adjusted Grading Scraper on the ground and driving forward enables the operator to grade o high spots and fill in ruts and low spots on unimproved roads and lanes with little or no manipulation of the tractors 3-point hitch controls. Unlike a rear blade, they require no adjustment of blade angling or o set positions. These Grading Scrapers simply and quickly move dirt or aggregate from high spots to low spots making them extra user-friendly and a low cost alternative for road grading applications.